For this application, the customer needed to complete a 90-degree transfer without having the product skew. The packages are coming out of a product sealer in batches of three. They are set at a particular width spacing which we matched with specific lane guides on the first conveyor in the system. The product travels down this conveyor onto a second conveyor and into a popup stager. The stager is there to ensure that the packages do not skew and it maintains equal spacing between products. The second conveyor is feeding into a freezer which requires the product to have a consistent orientation. 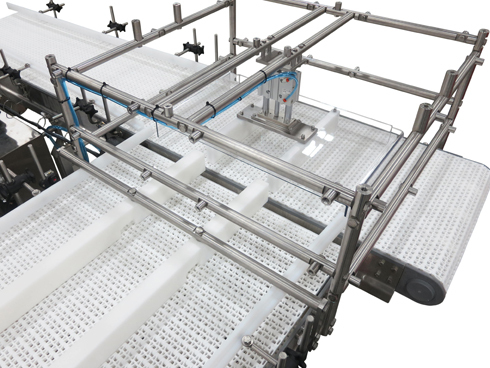 Using the photo-eye and built-in timer, the pneumatic guided cylinder then lifts the stager up and allows the product to travel down the conveyor. Once the photo-eye on the second conveyor detects the products are clear, the stager is returned to loading position.